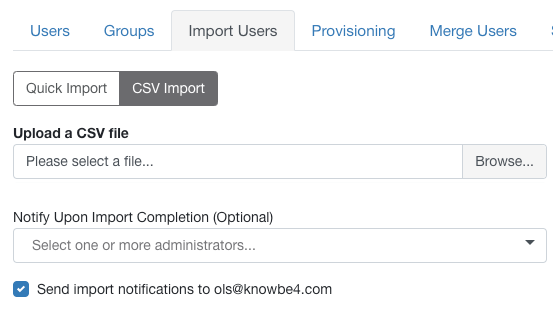 To bulk import users, or to add/change information about your users, you can use our CSV Import feature. Prepare a CSV for import. 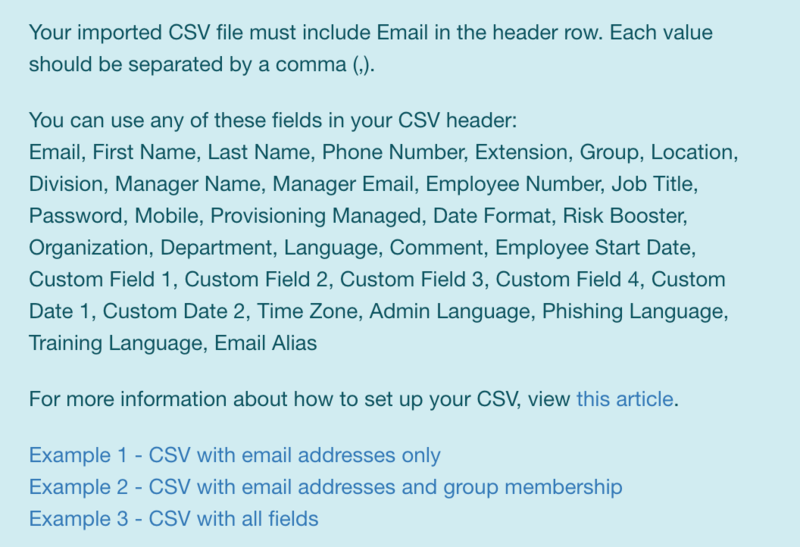 The only required field in your CSV is your user's email address, with a header line of Email, but we recommend including additional user information if possible. View our available import fields and their associated formatting requirements in the CSV Import Fields table below. Header fields must precisely match what is shown in the example CSVs. Navigate to the Users > Import Users > CSV Import tab. Click the Browse button to select your CSV. Choose who you want to notify about the user import in the Notify Upon Import Completion dropdown. By default, all console admins will receive an email upon user import. Don't have a CSV? We have three pre-formatted CSVs available in the console. These are located on the Users > Import Users > CSV Import tab. Click the Example with the formatting you'd like to use, then click Download Example CSV. The only required field is the Email field. Other fields should only be included if they are being used during import. As a best practice when you're first importing your users, we recommend that you add your user's first and last name along with their email address. 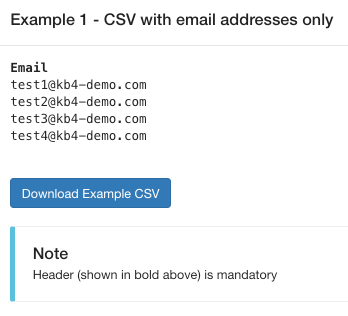 Email addresses in your CSV must match one of your allowed domains for a successful import. For example, user1@yourcompany.com, user2@yourcompany.co.uk. This means that if you have users at multiple domains, you'll need to add the additional domains to your account before you can start phishing and training those users. If you are unsure of how to do this, review this support article. Making updates to user information? You can import an additional CSV file over users that were previously imported and it will add any new data or alter any data you have changed. You can also use this method to add users to existing or new groups. See more about Group additions in our user fields table. Importing additional CSVs will not delete any user history. The CSV import allows you to import users in bulk with the following fields. Note that the header fields in your CSV must precisely match as shown in the CSV Fields column below in order for your import to be successful. Your user’s work email address. This is the only mandatory field for a CSV import. Personal email domains such as yahoo.com or gmail.com will not be accepted. The email domain must match an allowed domain on your account. If you are unsure of how to add allowed domains to your account, review this support article. Include a phone number or mobile number to use additional features, such as Vishing or AIDA, which requires or system to dial out or send SMS messages to users. This information is not required if you do not plan to use Vishing or AIDA. Use the Group field to automatically add this user to a new or existing group. If you include a group name that does not already exist, one will be created automatically upon CSV import. Group names must be between 2-64 characters. If adding a user to an existing group, you must match the existing group name exactly. If adding an employee to multiple groups, copy and paste the first entry for that employee and alter the Group field to add them to a different group. This would need to be done for each group you wish to add them to. For example, if an employee is to be added to five groups, they would have five lines in the CSV, each with a different Group listed--all other information would remain the same. Add an optional password for your users. We do not recommend this except in special cases. Your users will be prompted to set up their own passwords upon their first login. Minimum length depends on the minimum password length in your Account Settings. We recommend using multi-factor authentication for added security. If you’re using Active Directory Integration (ADI), you can set users to be AD managed (managed by ADI) or not using this field. See more about ADI here. FALSE = not AD managed. This means changes to your Active Directory will not affect this user as they exist in the KnowBe4 console. TRUE = is AD managed. This means that changes to your Active Directory will automatically update your user's information in the console. The user’s desired default date and time format. See more about date formats here. 1 = sets the default date and time format to MM/DD/YYYY hh:mm AM/PM (12-hour). 2 = sets the default date and time format to DD/MM/YYYY HH:mm (24-hour). Adds a Risk Booster to this user. See more about Risk Boosters here. Set to Low, Normal, High, Highest to indicate the user’s intended Risk Booster. While this feature does not currently integrate with other features, it may in the future. As such, the entry must match our existing languages available in the ModStore. Download a list of all languages here. If no time is included, it will default to 12:00 AM (UTC). You can add up to four custom entry fields for your users. You can add up to two custom dates for your users. Custom dates do not include a time, but if you import one as shown in the examples above, the system will still accept the included date. Download a list of all time zones in the proper format here. If you use the above format, the selected time zone used will be the first one that matches from the list.